Black and white is a major color combination for Spring 2013 season. Both colors have also appeared separately in numerous Spring 2013 collections. The monochromatic look is a classic one but the designers offered their takes on the classic color combo. Some designed oversize tops and jumpsuits in black and white, while others went to replace the trousers with bermuda shorts in the classic black and white shirt pant ensembles. Other designers went for black and white mixed prints and patterns. The black and white combination is easy to wear. Especially in the ready-made outfits. A total black look is also a stylish way to wear neutrals but an all white outfit can look equally great. There are only a couple of nuances. While the black color is visually slimming the white is visually enhancing so if you want to correct the figure opt for slimming black for wider parts and an enhancing white for narrower parts. You can also opt for a figure-correcting dress a la Stella McCartney. When it comes to prints and patterns remember that vertical stripes are slimming and elongating while horizontal ones are widening. 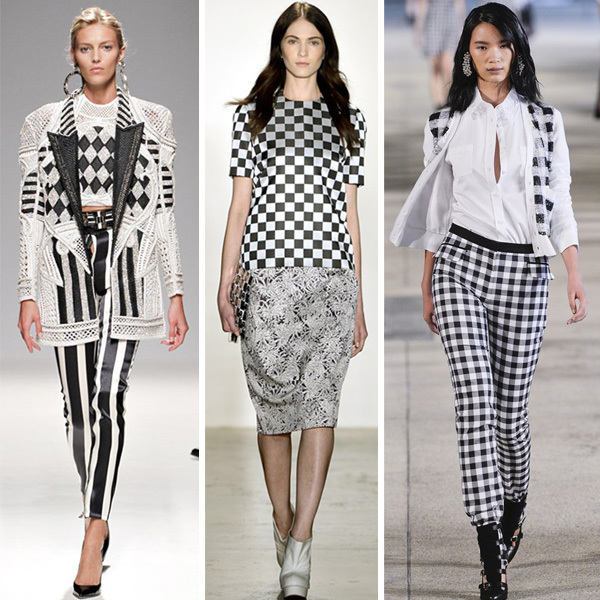 Among this season’s prints there were checkers, rhombs, stripes and florals. It’s easier to mix black and white prints as you don’t have to worry about coordinating colors. Make sure that the print scale is not too extreme though. The scale of the print is another thing to consider when choosing one to fit your figure. A too big print will accentuate a tiny frame and too small print will make the figure look bigger. Also wearing prints attracts attention so be aware when choosing a printed garment for the area you’d like to conceal or correct. As you can see the designers stay within the color combination without adding other colors much. At Chloe however models wore metallic bronze shoes. Metallics are another big trend so it’s a perfect mix for the season. So what do you think about this color trend? How will you be rocking it?